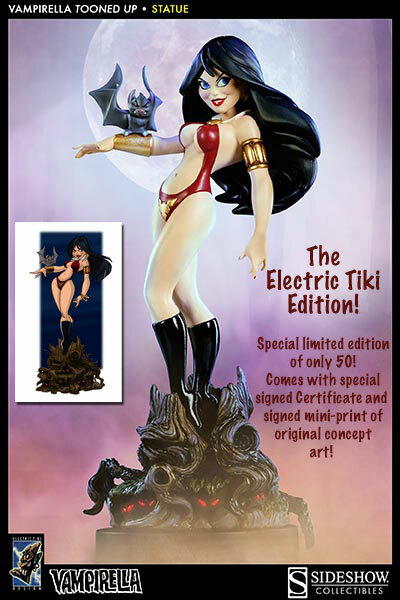 August 2013 - Electric Tiki - we are proud to announce an exclusive version of Sideshow's "Tooned-Up" Vampirella statue. Although this was 100% produced by Sideshow Collectibles, we at Electric Tiki Design designed the piece and oversaw the production. Our exclusive version, know as the Electric Tiki Edition, will be a separately numbered limited edition of only 50. It will come with a specially created signed & numbered Certificate of Authenticity, as well as a mini-print of the original concept art, that will also be hand numbered and signed. Retail price will match Sideshow's at $159.99, and you can pre-order yours with a non-refundable deposit of $25. Check in the "Exclusive Stuff" tab at the top of our home page.